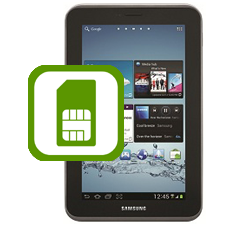 Does your Galaxy Tab 2 7 no longer recognise a SIM card or SD card when it has been inserted into your phone? Does it display a NO SIM error even though the SIM is present? If so it is a high possibility that your SIM or SD card tray has been inserted incorrectly and actually damaged the pins on the logic board that make contact with the SIM card. Allow our expert technicians to remove the damaged SIM card reader from your logic board and fit a brand new part restoring your Galaxy Tab 2 7 back to working order so your SIM card will be detected correctly. As we use original Samsung parts for our Galaxy Tab 2 7 SIM reader repairs so your phone will function like new when repairs are completed. * Price includes a new complete Galaxy Tab 2 7 SIM card reader assembly, fitting and fully insured return shipping in the UK. This is an in-house Galaxy Tab 2 7 SIM card reader repair service, when ordering this repair service you are required to ship the phone into us for work to be completed.